This entry was posted on Friday, December 25th, 2009 at 11:43 am and is filed under My life & thoughts. You can follow any responses to this entry through the RSS 2.0 feed. You can skip to the end and leave a response. Pinging is currently not allowed. 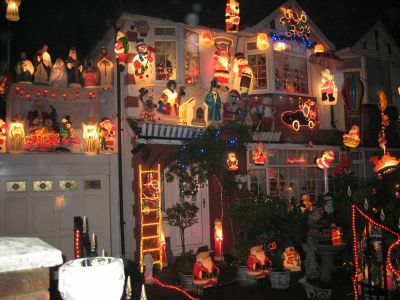 What a tastefully decorated house ! People don’t go to the same extremes of house decoration over here in New Zealand which is a shame. Probably to do with the fact it doesn’t get dark while 9pm-ish so you have to stay up late if you want to see people’s lights. Anyway, we wish the whole Darlington household a fantastical Christmas and a happy & healthy New Year. Come on, Roger, admit it… it’s your house! (smile). I hope you had a great Christmas season and hope to catch up soon!